Read all the way through to find out information about our new AMAZING RAFFLE!! When: Starts at 2:30 p.m. on Sunday, September 16, 2018. Where: The back of Silver Parking Lot 13 – Along the Grass – You’ll see us. How to Contact Us: Leave a message on the board or send an email and I’ll send you a number. What to bring: BYOB and any specific food you want to bring. We’ll have grills available to cook on. We always have plenty of food to share. If you’re traveling from out of town, we got you covered. Cash donations for supplies are always appreciated and put toward group costs. We also have space in the ice filled coolers for any beverages you might bring. Keep in mind: This parking lot require a parking pass. Cash parking is nearby and you can walk to the tailgate to hang out if you’d rather save a few bucks. If you want a parking pass you can check the NFL ticket exchange or Stub Hub for tickets. PLEASE READ IF YOU’RE FROM OUT OF TOWN RE: ALCOHOL SALES: NO LIQUOR SALES ON SUNDAY. If you want Liquor make sure you get it on Saturday before 9pm. All bottled liquor sales stop at 9pm on Saturday night. Also, BEER IS NOT SOLD IN THE STORE UNTIL 12pm ON SUNDAYS, so you may want to buy the night before if you’re going to bring something with you. Travel to the game from the Weekly Watch Party: We’ll all be meeting up at Buffalo Joe’s around 12:30 p.m. to pack the cars. The goal is to leave the bar by hopefully 1:15pm to 1:45pm. Gates for the tailgate open up at 2:30pm. Why not wait in line at Silver Lot 13 and enjoy some chill time before they open up the gates? This meetup is for the NY Giants tailgate that will be held in Parking Lot 13 of the AT&T Stadium for the season opener against the Cowboys. There is another meetup for those who will be watching the season opener at Buffalo Joe's Bar. 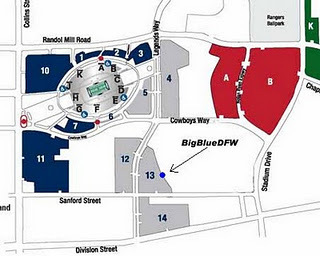 Come join us in the back of silver lot 13 where we'll be hosting the annual BigBlueDFW tailgate. We'll supply all the laughs and good times of a NY Giants tailgate like it is back home. I promise you won't be disappointed. We can't wait to see you there. Did somebody say Raffle?? Damn right we did. First ticket....FREE!! You want an additional ticket....$5.....The $5 helps to fund future prizes. What are they you ask? Keep following for more info. I'll post more info on prizes in the coming days. Let's just say ...signed memorabilia... Bring some cash because I guarantee you'll want a shot at winning. Can’t wait to see everyone…. As free agency slows down, we begin to move closer to Draft Day 2017. Fans of BigBlueDFW look forward to picking the first round talent they believe will make their way to the New York Giants, and provide bragging rights to the individual who picked the correct player. Historically, the Giants believe in a philosophy of drafting the best player available. While I believe they won’t deter from this, there are years where you still have to draft a best player available at a position of need. This is one of those years. Baring a slip of a can’t miss talent, I believe the Giants will look towards a player that fits the culture and necessary needs of the team. For the 2017 Draft, the New York Giants select…….. Garrett Bolles, OT, Utah. Based on what we’ve seen this year, the cost of an experienced lineman through free agency does not seem the cost-effective way to pursue depth at the position. Limited improvement from Ereck Flowers and missing out on the opportunity to grab Laremy Tunsil proved costly to the Giants. While I would love Cam Robinson, or Ryan Ramczyk, I can imagine the other NFL teams will also be excited to bolster the Offensive Line through the NFL draft. Stay tuned for further BigBlueDFW fan picks for the 2017 NFL Draft. Aparently 6-10 records don't motivate any of us. But to keep with tradition - I thought I would post some of the BigBlueDFW 2015 draft picks. If anyone wants to join the fun - just add who you think in the comments below. Giants vs Cowboys Tailgate Raffle....and IT'S FREE!!! Yet another reason you don't want to miss the tailgate this year. We'll be introducing a raffle to the tailgate. I'm not talking trinket items. We're talking MEMORABILIA!!! What's the cost??? NOTHING. This raffle is completely free to show our love for the Giants fans who choose to show up at the tailgate. So come on out and join the rest of the NY Giants family as we party it up before the Giants play the Cowboys. Click here for more info from the www.meetup.com/BigBlueDFW page. If you're unable to attend the game - you're still welcome to watch it at Buffalo Joe's. Since most of us will be at the game - the crowd might be a little lighter than normal. We will be tailgating in Silver Lot 13. (It's Southeast of the Stadium at the corner of Legends Way and Sanford Street). Since we won't know an exact location yet - we should be on the east side of the lot along the grass parking spots...basically the perimeter of the lot. (I've included a parking map below for illustration). NOTE - Not everyone has to have a Silver Lot 13 Parking Pass. Most people find parking elsewhere (another parking pass, cash lot, etc) and join us at Lot 13. Feel free to join us at any time prior to the game. Since we never know how many people to expect - we've decided to make it easy and do a "BYOB" and a "BYOF"...bring your own beer and bring your own food. Basically - if you want to eat something specific- bring it. If you want to drink something - bring it. We'll have a grill there for anyone that wants to use it and a fair amount of cooler space too. If you're traveling from out of town, we should have plenty of food to share. Keep in mind, cash donations are welcome and appreciated. All extra cash goes to group supplies and costs only. Our plan is to be there around 10:30an (or as soon as they let us in the gate). So come out and get an early start with the BigBlueDFW crew. It's pretty much a guaranteed good time! Win or lose - we'll be there after the game - so join us for some post game fun! As most of you know, this is a tad bid inaccurate. The Giants traded their 2014 7th round pick to the Carolina Panthers for Jon Beason in the 2013 NFL season. The best part about this trade? We've already seen what this guy can do. The 7th round pick is usually regarded as a project draft pick. (Ahmad Bradshaw may go down as the best 7th round draft pick the Giants have ever had.) Beason resigned with the Giants and solidifies himself with a defensive roster spot. Not only as a solid linebacker, but a natural team leader. This Mic'ed up video on Giants.com helped to remind me of how valuable of a trade this turned out to be. Here's to seeing what he can do in 2014. Click here to listen to Jon Beason Mic'ed Up. For the sixth time in eight years the NY Giants have drafted a running back in the NFL draft. Most of us know that the running back position doesn't seem to carry the same early round draft significance it once did. This year the Giants decided to dedicate their fourth round pick to a Heisman finalist running back out of Boston College. We all know Tom Coughlin's affiliation with BC. That said, I for one, am very excited about the fourth round pick of Andre Williams. I've heard that Andre Williams fell in the draft due to his limiting capabilities of being able to catch in the back field. I could care less. While I'd like the added bonus of a pass catcher, I'd love an old school back who can handle the ball, run it up the middle and show the fans that he's old school Giants football. I think that NFL football today tends to focus too much on hybrid player positions. I'm happy with tradition. Show the division rivals what it feels like to have a ball carrier deliver a shove to the chest. Just like ole Jack Burton used to say. While we wait for the new season, take a moment to enjoy an article for our former NJ Star Ledger Giants beat writer Jenny Vrentes, who leaves us with a fascinating story about Andre Williams and his NFL draft experience. Going to try and throw up some quick hits as we go finish up the NFL draft weekend. Here are some initial grades of the New York Giants drafts picks for 2014 courtesy of CBSSports.com. Can't wait to revisit this at the end of the season.